I show you how the organizing purpose of life is the inhabitation of and unbounded expression of your Excellence. Excellence is the unique embodiment of your gifts and talents through your greatest liberation. Readers discover that Excellence requires immense freedom from the constraints of their life and a robust fullness of expressing their unique gifts and talents in life. Excellence is the singular guiding principle that calls you forth and draws you out of what you are into what you can become. I show you how Habituation is the perennial obstacle to you becoming more, to you embodying your purpose in life. Habituation is at its essence an automatic response. You learn that strength is, at its core, animated through two mediums: Doing and Being. Strength’s most profound expression, and its most simple expression, is in the capacity to Be. Being is a limitless field of presence. It is your capacity to both witness and inhabit your life. Being is one of your most essential assets. This is especially the case when we consider what can liberate you from the habituation of your body, mind and life. Finally, you learn that strength training can be a training ground for Excellence. It is a tool to become less defined by the habits of the past that automatically repeat. Discover how Rob’s journey with Asthma and Death was his wake up call. 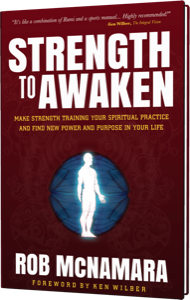 You will be challenged to consider your own calls to awaken and become more in life. Plus, I show you the two facets that are absolutely necessary for change and how death is the most powerful fuel to move you forward in life. I show you the essential process and architecture of the ego and how this part of yourself unknowingly unplugs you from your larger happiness. You learn to see through one of the most pervasive myths created by the ego. Readers learn that true strength is an invitation to participate with the happiness that resides right here in this moment, beyond your conditioned struggles. Readers find out Strength and Excellence move in concert; they mutually depend upon one another and reinforce each other. Readers clarify their life by understanding the real relationship between happiness and comfort. True happiness is shown to be the complete acceptance of, and engagement with, the present moment. Readers discover that a habitual drive for comfort often costs them their true happiness. I show you how the ego has varying degrees of distortion which disconnects you from attuning to the present moment. A key takeaway is that to know genuine happiness, you must go beyond the functioning of your ego. Readers uncover that radiant joy and unbounded happiness stem from the engaged embodied presence of Being. and learn the intention to cultivate a new relationship with the present moment is the key to joy, true happiness and the creation of Excellence. One key benefit you get from chapter four is the understanding that liberating yourself from habituation makes you more proficient at achieving your drives and goals. The objects of your ego’s desires are much more swiftly and easily attained by going beyond your habituated struggle. I show you how practice is preparation and how practice is your conscious engagement with your training and life which creates more competence in life. Practice is the way you become more. You learn that engagement is the conscious inhabitation of your body and mind. It is a present, attuned participation with your training. Readers discover how engagement is the conduction of your free and open awareness through your activities, whatever they may be. I show you the problem when you stop practicing. When you become comfortable or when you are able to create some level of adequacy in life, habit often steps in. This stops practice. You stop stepping into becoming more and start repeating the past. Readers learn that soon life will present you with challenges that you have not appropriately prepared for. You learn how the desire to go beyond your habits in the gym and life, to free yourself from the unexamined constraints is the heart of strength. Readers go on to learn that practice in one area or domain is insufficient to meet the complex demands of life. Leaving out important dimensions of yourself often leaves you underprepared and underdeveloped. I show readers how integral practice, the engagement of all of your major faculties in the present, can be used to refine all of the major aspects of the self, thus preparing you to achieve more. You learn why training just train your body is a waste of time and energy. You discover that there is no reason not to train your body, mind and heart simultaneously. 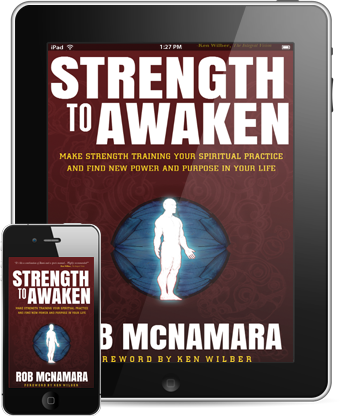 Readers discover that strength training can become a powerful integral practice for them, enabling them to become more. Grow, refine and develop yourself physically, emotionally and mentally as well as spiritually all from your workouts. You learn 3 of the major ways the ego hijacks your training, which stunts your efficiency and limits the results you are able to enjoy. You will discover the costs of the ego’s pervasive desire for novelty. You learn to recognize the ego’s distractibility. As you will see the ego lacks the ability to genuinely focus, it depends on novelty to create a temporary concentration. When novelty wears off so does focus. I will show you the consequences of the ego’s unexamined struggle with the present moment. Struggle with weight, body-image, being able to lift more weight and so on often show up as unquestioned and never ending desire to get somewhere else. Sometimes this hurts you and sometimes this helps you. I show you how to get what you want without holding ourself back. I teach you how goals can either fuel your ego’s ineffective struggle or yield greater results as you train for Excellence. Readers gain discernment into whether a goal challenges you to become more (to create Excellence) or goals attempt to (struggle to) get you to become something else or get somewhere else. I show you how in strength training your ego attempts to maintain comfort with two basic strategies that ultimately limit your pleasure and results. You learn to identify two of the most common limiting egoic thought patterns: the “I should” and the “I have to.” You learn how the ego is invested in disengaging from your training while your drive toward Excellence is invested in engaging your training. As you discover that your ego actually does not want happiness and joy you start to free yourself up from its limiting habits. The ego actually desires comfort. Some other part of who you is drawn to a genuine joy and pleasure that is beyond the ego’s habituated struggle. You learn how to grow yourself into a larger, more capable, you. Finally, you learn that the strength training is a microcosm for the macrocosm of life. If your training is governed by the ego, you are governed by this limiting way of functioning in the rest of your life. Similarly, if you can out grow your ego in your strength training you will be able to out grow egoic limitations that show up in other areas of your life. It’s simple, I show you how to grow in the gym, you discover how this change translates beyond the gym. You learn that egoic struggle is not just an idea but also corresponds to muscular tension. The body and mind are not as separate as the ego prefers to think about itself. The main point is this: your ego has a certain range of tension in which it flourishes. I teach you the two basic ego boundaries (upper and lower ego boundaries) and how to pragmatically expand both in strength training. You get two simple straightforward strategies to outgrow your ego. Wholehearted engagement, when properly understood, is a reliable antidote to the ego’s habit of dividing and fragmenting your energy as a persistent struggle. 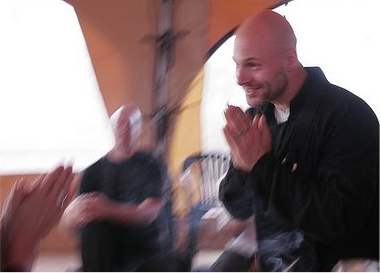 You discover the two main ways in which the ego mis-interprets engaging whole heartedly. First you see how this intention is not a destination that you will arrive at in the future and how it is not a space where there is no struggle present. This can free you up from years of inefficient struggle. I show you the three “inner movements” of engaging wholeheartedly: Intention, Attunement & Engagement. I teach you which intentions can lead you toward your larger Excellence and which ones are likely to leave you stuck in your ego’s limited struggle. Your takeaway is how your ego, when compared to your integrated body-mind that originates beyond the ego, is less structured, less pragmatic, less effective and less efficient in the gym and in the world. I show the difference between the conventional understanding of discipline and the larger relationship with discipline that is beyond the grasp of the ego’s struggle. This is a relief to many. You also learn how discipline is of necessity and, yet, it also carries with it a risk. Shifting beyond the ego requires a discipline that is not resting on or dependent upon your egoic wants and desires. You discover that your larger sense of self moves beyond habituated thoughts and feelings with ease. From this greater vantage point you are able to take the course of action that actually serves your larger intelligence and Excellence. Instead of your egoic preferences collapsing around what your ego prefers to feel and prefers to avoid feeling, your liberated intelligence can navigate your training and life with greater simplicity and skill. I show you the main ways discipline also carries with it great risk. You learn how the ego loves to struggle with discipline and I show you 3 language cues that stem from the ego’s command of your attention. This chapter clarifies your relationship with discipline so that it does not get hijacked by your ego and its inefficiencies. You gain access to a first of it’s kind developmental model of strength training. This model was created from a synthesis of a dozen models of human development and my experience with strength training over two decades. You learn where you are developmentally along the path to what I call Mastery. You learn to discern as we investigate 6 stages of strength training and their major characteristics and defining limitations. With each limitation I show you how the next stage of development supersedes the previous stage. I show you as you grow, you become more capable. I show you a creative synthesis of all major elements of the book outlined as one practice: Body-Mind-Moment Training. You learn how this integral practice aligns and engages all of your major faculties into the present moment. You discover that cultivating a larger, freer, relationship with the here and now is based on two guiding principles: Acceptance and Embrace. Acceptance is rooted in non-struggle while Embrace involves an intimate engagement with what is. I show you two simple strategies to create more engagement in every facet of your training. You will learn my proprietary six stage model of engagement. Over the course of years of disciplined training, experimentation in the gym coupled with countless hours of writing and reflection I have crafted six progressive stages of engagement for you to follow in every set of every workout. I show you how the more proficient you are at engaging determines the progress, or lack there of, you are capable of. Reading this one chapter can save you years of inefficiencies. Two of these stages are likely familiar to you; however, the remaining four stages are dimensions of training that you have likely been unaware of. Regardless of your engagement right now, I show you how to progressively refine your engagement to improve in your very next workout and how to efficiently deal with common distractions that cost you time and energy. I show you the typical forms of inner resistance that each stage of engagement has. As you will discover, these types of inner resistance are not bad. Contrary to what you might think, you learn how to use each stages’ forms of resistance to progressively step into a more refined engagement with your training. While resistance is an obstacle, if you are to grow in your proficiency to engage and thus yield results more effectively you will discover how these common forms of resistance are also an indispensable fuel to refine your training. Resistance can either leave you feeling frustrated or it can be a fuel to move you forward. I show you how to leverage resistance as a fuel. I show you the two basic principles of movement and how your training can grow to proficiency include both. You learn how to include these in every single set you do as well as how to integrate both principle ways of moving into your workouts. The majority of strength training only addresses one of the basic principles of movement, including this all important second has much to do with the amount of pleasure your training elicits. You will learn the three stages in the U-Theory of Performance and find out how to assess where you are along this progression. You learn to identify when a loss of performance is a step in the right direction or when you’re simply headed in the wrong direction in your training. Furthermore, you learn the Peak Performance Triad and how you can use these 3 metrics can improve the results you gain from your training. I show you the necessity for an integrative approach to measuring performance. When we only look at external behavior measures of performance we miss your interior psychological engagement (or lack there of). Your highest levels of performance require systematically training the external and internal dimensions of you. I show you how self-sacrifice is a prerequisite for peak performance and I explore two different types of self-sacrifice. One holds you back while the other progressively pulls you forward in terms of what you are capable of. I call this the double edged sword of self-sacrifice. If you are serious about performing at your very best, this distinction is indispensable. You learn that there are three broad domains of performance. One is based on submission, another on personhood while the third is Surrender. I show you the strengths and limitations of each stage and I provide you a clear path through submission and personhood, both are riddled with limitations. Readers learn that Surrender is not a loss of control but rather the full maturation of control. It is this mastery that yields the highest known expressions of performance, what I call the heart of performance. I show readers the most accessible doorway to enacting this heart of performance. These are what I like to refer to as Performance Groves, it is a profound Surrender coupled with your rigorous training and conditioning. Anything less than this misses the mark. You learn the heart of performance is not a luxury. Creating your highest levels of execution is not something that’s nice to have. Rather, it is a central part of the purpose of your life. The stakes are high, failing here in your training is a failure of who you are and why you are here. This chapter gives you the support and direction needed to excel in new ways. I show you the 4 dimensions of performance that must be navigated skillfully for performance to refine and ripen. You will learn the most important considerations within each and I have written this so that you can easily apply these insights into both in your strength training as well as any other area of your life that you are refining you ability to perform. For example, performance states are unpacked and you are given tips and strategies to both create and maintain the performance states that best support your performance. I show you the four interrelated dimensions of training. Chapter 18 tours these domains of practice within your workout. You learn tips to manage the relationships occuring within your training. These include training partners, professional trainers guiding and supporting you as well as other people at the gym. I show you how to minimize social distractions which ultimately stunt your results. You also learn a simple 3-step process showing you how to leverage training partners to help move you more swiftly toward the goals that matter most to you. Finally, this chapter takes a look at an often neglected dimension to training: equipment and environment. You learn the importance of the diversity of equipment that is available to you, the 3 main sources of resistance to integrate into your training as well as critical considerations for those interested in developing a home gym. Using the dimensions of training outlined in chapter 18, I show you how these same domains can continue to be worked with after you have finished your training. I tour 19 different exercises or practices that can be done after you have finished your training which ultimately help develop and refine who you are and what you are capable of doing. For the performance minded individual, these provide often overlooked ways that you can improve your very next training session or competition. You learn the two basic types of injuries and how each impacts you and needs to be worked with. I also show you the two central purposes of injury and how the ego tends to relate to injury. Here is the important part: one aspect of your ego’s struggle with injury is a healthy part of the recovery process while other aspects of this egoic struggle inhibit recovery and can even make injuries more persistent. You learn how to tell the difference. Finally, chapter 20 teaches you the single most effective way to work with injuries within the context of training and I show you how the stages of engagement relate to the healing process. No training manual is complete without a discussion around recovery. I show you the most comprehensive approach to recovery ever written on strength training. Recovery is treated in two sections, one on how to more efficiently recover during your training and the second explores essential parts to recovery between your workouts. You learn how to optimize recovery psychologically and physiologically. When the tour of your recovery during your workout is over you will have discovered the 19 most proficient practices to optimize your recovery. I also show you the all important relationship between relaxation and performance. I teach you the one distinction that enables you to allow relaxation to work for you, not against you (yes, relaxation can and often does work against you). Post training recovery brings with it 18 leading strategies for optimizing recovery between your training sessions. Employ even just part of these techniques and you will find yourself progressing faster and with greater ease. Why? Because you will be more resourced. Everything from nutrient timing and nutrient coupling, helping your body flush and process toxins and other byproducts from training, the role of psychological space, reflection and learning to the social dimensions of recovery are covered. Recovery is the single fastest way to improve performance and this chapter is loaded to help you do just that, recover more efficiently so you are more resourced to engage your training with greater proficiency.